Although I didn’t attend many of Supercell’s daytime events—performances, workshops and technique and master classes—I felt their impact in the evenings. The foyers were brimming with life: eager audiences, improvised dance pieces and overseas artists hanging out with local dancers. Supercell was substantial enough to create the glamour of a major event but with the hothouse ambience of, say, a writers’ festival. The work opens with a deconstructed set—floor-length white curtains in the far corner, the stage littered with cushions, a white plastic pedestal fan, a mirror and a desk. The women move sinuously, with a casual grace that is slightly predatory. They introduce themselves and begin with the gambit, “If I had to sleep with one of you tonight, it would be you.” There is a palpable stilling in the room, arousal and embarrassment, but also utter engagement. Watching the documentation of this heavily toured show online, you see the same glazed fascination on the faces of audience members around the world. The choreography unfolds with precise delicacy and control. Surreptitiously, the women set up subconscious Freudian feints, handing audience members notes and instructions. At one point I looked up with complete surprise to see a single shoe had mysteriously appeared, vulnerable and alone, on a cushion centrestage. Each of the women performs languorously ordinary solos—the white plastic pedestal fan tilts slowly to blow the hair of an almost falling woman; a monologue is addressed to the mirror; a slow exit is made via a stage door left ajar. The work builds into sequences with pairs and threes, sylph-like and deliberate with a choreography of not quite sexual movement—hands grasping just under the waistband of another’s jeans, the slow pull of arms and legs entwining. The show climaxes with two motifs designed to pull us out, just a little, from our pleasuring gaze. First, a tableau sees the women moving together slowly, like sea creatures, spittle falling delicately from their mouths. They don transparent plastic masks that pull their faces into shining distortion, then gently remove them and watch us as we leave the theatre. 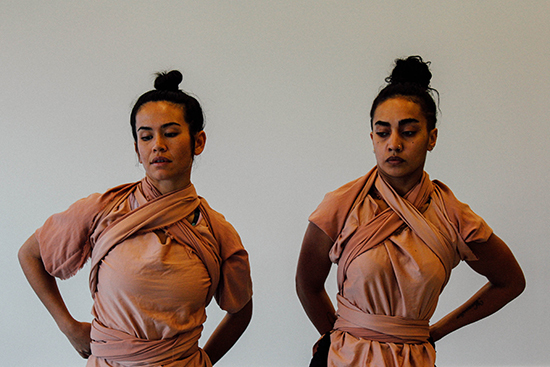 The focus on the gaze and the female body was also central to Passing, a work by Bundjulung and Ngapuhi dancer and choreographer Amrita Hepi and multi-disciplinary performer from Fiji/NZ, Jahra ‘Rager’ Wasasala. This dynamic trans-Pacific duo set out to explore the idea of racial passing and what it means to live across different cultures. This voluptuous piece unravels, literally and metaphorically, through the draping flesh-covered costumes and their long, flowing sleeves that sometimes confined the dancers. The work relies heavily on sound, with music and words representing post-colonial objectification but also the fierce reclamation of traditions and urban culture. The most arresting scenes occur in the final stages of Passing when both women, stripped back, lower themselves into steel buckets and we watch their muscled backs and long hair become engulfed in and saturated with water. While very different in tone from (To) Come and See, Passing employs similar strategies—using the power to shock, arouse and disrupt in order to reclaim the female body. Another international work, Pearl River Delta Dance, comprised a series of short excerpts from contemporary works: four from Macau and one from mainland China by the prominent Guandong Contemporary Dance Company, long-term collaborators with Brisbane’s Expressions Dance Company. Sadly, we saw only four minutes of a lyrical and flowing two-hander, Point One, an excerpt from a full-length work by young choreographers Li Pian Pian and Tan Yuan Bo. In contrast, the pieces from Macau were much less classical and hinted at a fertile and wide-ranging culture of contemporary dance, from Albert Garcia’s cheeky Four Legs is Good, Two Legs is Better, that explores the idea of contemporary royalty and stars the best puffy white shirt I have seen since Seinfeld’s pirate version. Garcia primps and poses in his satin boxer shorts and the narcissism explored seems very culturally transportable. 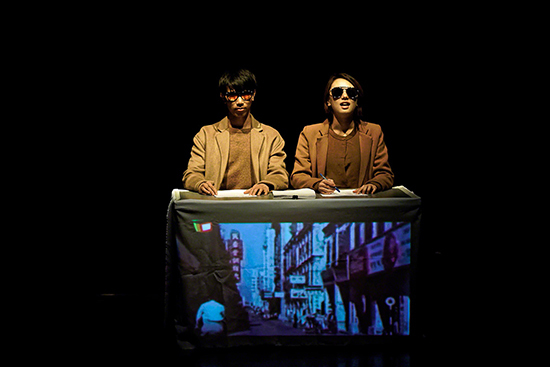 The third work, a solo titled The Sun Rises as Usual created by Macau-based Stella and Artists, was probably the most opaque for a Western audience. My reading was a political one as the title is also the response of the Chinese government to a pro-democratic incident in Hong Kong in 2014. It was also the most implacable, with the bulk of the choreography expressed in one move: the dancer back-flipped, then held her back-bend in pose until she collapsed, only to flip again until she had crossed the stage. Finally came The Hands by Macau company Max Dance Hall, a kaleidoscopic short work that followed a duo of corporate-clad “fake journalists” reporting on events since the Cultural Revolution of 1967 but then throwing away their desks, sun-glasses and briefcases to pull, jerk, salute and collapse their way through what seemed to be a disintegrating world. What united the works in Supercell was quality, displayed across a “broad church” of contemporary dance as expressed in the festival’s curatorial rationale. Let’s hope this distinctive festival continues well into the future.